Brain training with virtual reality systems and robotic exoskeletons are helping paraplegic patients regain some sensations and possibly mobility. Brain-machine interface is changing diagnoses from complete to partial paralysis. Researchers have just witnessed something that they say has never before been seen in the field of medicine: Patients who have been severely paralyzed for more than a decade have regained some sensation and neurological control in key muscles. In other words, they can move again, at least a bit. Paraplegic people with spinal cord injuries spent a year training on brain-machine interfaces, such as virtual reality systems and robotic exoskeletons, which allowed them to use their own brain activity to simulate control of their legs, according to a small study published in the journal Scientific Reports on Thursday. The findings suggest that long-term training on such interfaces that utilize the virtual world could help paraplegic patients regain some sensations and possibly mobility in the real world, said Dr. Miguel Nicolelis, a neuroscientist at Duke University who led the study as part of the Walk Again Project in São Paulo, Brazil. About 282,000 people are living with spinal cord injuries in the United States (PDF). Most of the injuries are a result of traffic accidents, falls or violence, according to the World Health Organization. "Since I went to medical school, I heard that there was no hope to recover patients with spinal cord injury," Nicolelis said. "So, I was shocked. I was really shocked, so much that it took us several months to report this because we wanted to confirm every detail," he said of the study findings. "Brain-machine interface, we designed this in the late '90s as a potential technology to assist patients to move, as an assistive technology. We never thought that we would induce neurological recovery in these patients." The study involved eight paraplegic patients who had been completely paralyzed for at least three years due to spinal cord injuries. They were asked to spend at least two hours a week training on brain-machine interfaces over the course of a year. How did the brain-machine interfaces work? The patients were fitted with caps lined with electrodes that recorded their brain activity. 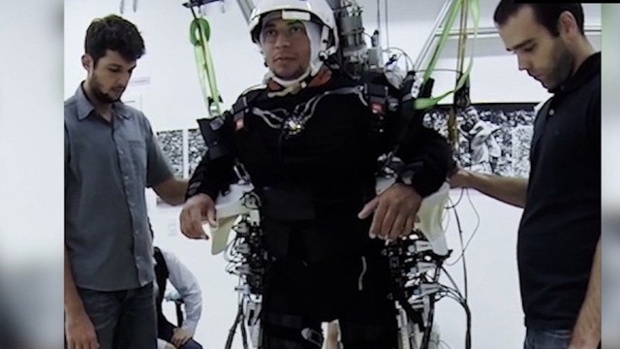 That brain activity triggered movements or behaviors in virtual reality systems and robotic exoskeletons, such as making the virtual avatar of a patient walk. Then, the interface sent signals back to the brain, such as the sensation of movement, Nicolelis said. "So you're getting an exoskeleton, and your brain activity is triggering the device to move, and you're getting feedback from the device. You're feeling the ground; you're feeling the legs walking," he said. "If the brain of a paralyzed person is engaged and imagining movements and controlling a device directly and then the brain gets feedback from this device and the body of the patient is moving too, the brain is reinforced. The brain says, 'OK, I'm imagining that I'm moving, and something moved.' "
The researchers conducted clinical evaluations on each patient on the first day of the study and then repeated those evaluations after four, seven, 10 and 12 months. "After we did this for several months, we tested the patients outside of the [brain-machine interface] device, and to our shock, people who were not supposed to move ever again in their lives were spontaneously moving their legs and feeling sensations," Nicolelis said. Indeed, the researchers discovered that all of the patients experienced significant improvements in their recoveries. Four improved so much in their sensation and muscle control that their diagnoses were changed from complete to partial paralysis. Additionally, many of the subjects reported improvements in their everyday lives. Two became more independent in the bathroom, able to more effectively move from their wheelchairs to the toilet. Another patient reported an improvement in moving from the wheelchair to the car, according to the researchers. In a separate proof-of-concept study, published last year in the Journal of Neuroengineering and Rehabilitation, scientists in California demonstrated that a brain-computer interface system could be used to allow a paraplegic patient to take steps using nothing but a brain-controlled muscle stimulator. "The study by Nicolelis and colleagues employs very similar methodologies with the addition of tactile feedback," said Zoran Nenadic, an associate professor of bioengineering at the University of California, Irvine, who led the proof-of-concept research and was not involved in the new study. "The [new] study presents encouraging findings which demonstrate that a combination of a non-invasive brain-computer interface for restoration of walking and tactile feedback can lead to improvements in both motor and sensory functions in a small group of individuals with paraplegia, or the inability to walk," he said. "This approach could potentially lead to the development of novel physiotherapies for those with complete or incomplete loss of leg function due to spinal cord injury." The researchers also hope that brain-machine interface devices could be offered as therapy options for paraplegic patients around the world. Seven of the patients in the new study have continued their rehabilitation with brain-machine interface technologies, and the researchers are continuing to document each patient's progress. "What this suggests is that, in the future, you could go to a rehab center for an hour a day and either do a virtual reality session or get inside of a robotic device and walk back and forth for an hour under the control of your brain," Nicolelis said. "When you get out after this training is done, after months, you basically feel that now you can move your leg. You now have reacquired several functions that you have lost because of these spinal cord injuries." A paralysed woman who controlled a robotic arm using just her thoughts has taken another step towards restoring her natural movements by controlling the arm with a range of complex hand movements. Thanks to researchers at the University of Pittsburgh, Jan Scheuermann, who has longstanding quadriplegia and has been taking part in the study for over two years, has gone from giving "high fives" to the "thumbs-up" after increasing the manoeuvrability of the robotic arm from seven dimensions (7D) to 10 dimensions (10D). The extra dimensions come from four hand movements--finger abduction, a scoop, thumb extension and a pinch--and have enabled Jan to pick up, grasp and move a range of objects much more precisely than with the previous 7D control. It is hoped that these latest results, which have been published today, 17 December, in IOP Publishing's Journal of Neural Engineering, can build on previous demonstrations and eventually allow robotic arms to restore natural arm and hand movements in people with upper limb paralysis. Jan Scheuermann, 55, from Pittsburgh, PA had been paralysed from the neck down since 2003 due to a neurodegenerative condition. After her eligibility for a research study was confirmed in 2012, Jan underwent surgery to be fitted with two quarter-inch electrode grids, each fitted with 96 tiny contact points, in the regions of Jan's brain that were responsible for right arm and hand movements. After the electrode grids in Jan's brain were connected to a computer, creating a brain-machine interface (BMI), the 96 individual contact points picked up pulses of electricity that were fired between the neurons in Jan's brain. Computer algorithms were used to decode these firing signals and identify the patterns associated with a particular arm movement, such as raising the arm or turning the wrist. By simply thinking of controlling her arm movements, Jan was then able to make the robotic arm reach out to objects, as well as move it in a number of directions and flex and rotate the wrist. It also enabled Jan to "high five" the researchers and feed herself dark chocolate. Two years on from the initial results, the researchers at the University of Pittsburgh have now shown that Jan can successfully manoeuvre the robotic arm in a further four dimensions through a number of hand movements, allowing for more detailed interaction with objects. The researchers used a virtual reality computer program to calibrate Jan's control over the robotic arm, and discovered that it is crucial to include virtual objects in this training period in order to allow reliable, real-time interaction with objects. Co-author of the study Dr Jennifer Collinger said: "10D control allowed Jan to interact with objects in different ways, just as people use their hands to pick up objects depending on their shapes and what they intend to do with them. We hope to repeat this level of control with additional participants and to make the system more robust, so that people who might benefit from it will one day be able to use brain-machine interfaces in daily life. "We also plan to study whether the incorporation of sensory feedback, such as the touch and feel of an object, can improve neuroprosthetic control." Commenting on the latest results, Jan Scheuermann said: ""This has been a fantastic, thrilling, wild ride, and I am so glad I've done this." "This study has enriched my life, given me new friends and co-workers, helped me contribute to research and taken my breath away. For the rest of my life, I will thank God every day for getting to be part of this team."